Cool! I want a platform I can plug my bass into & levitate while I play! Hey Rusty , I was thinking the same thing. No better way to live the " High Life " ! My son bought me a ticket to do one of those simulated sky diving things that has the huge fan that blows you up in the air. I wonder if they would let me bring my bass? I could do my Andy West imitation! I would never jump out of an airplane, but I've always wanted to do one of the simulators. They built a new one a block from my oldest son's house so my youngest son gave us all tickets for Christmas to do it together! That sounds like fun ! I can not see my self jumping out of an airplane either. I have a friend who served as a paratrooper of the 101st Airborne Division during the Vietnam era who tells me it became second nature. The jump became fun he will tell you and what and what was to transpire at low altitude and landing was the possible complication. He was a radioman and path finder and never hurt anyone and he was also a combat artist and an amazing sketcher and and painter. 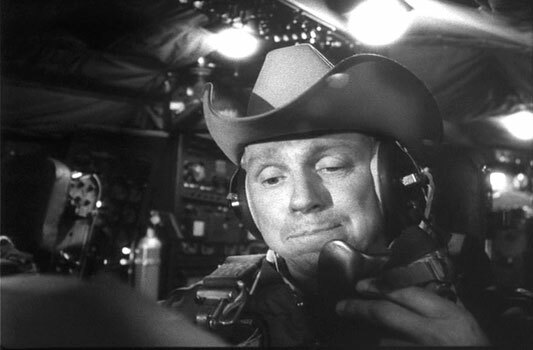 He kind of remeinds me of Louis Burton Lindley, Jr., better known by his stage name Slim Pickens. My son is coming home from LA May 5 so we are going to do the simulator then. I'll let you know how it goes!